Just what the doctor (would have) ordered … two days spent spinning and reading and sleeping. When I got home on Saturday afternoon, all I wanted to do was … spin and read and sleep. I pulled out this pretty roving dyed by Jessie at A Piece of Vermont. It’s her “Real Vermonter” blend of 60% Romney/Corriedale and 40% alpaca, all Vermont-grown. The color is called “Happy,” which is just exactly how it makes me feel. Mister Reeves and I are getting along famously, and I’m back to spinning as well as I’m used to. This big wheel took a little getting used to! I have four ounces of fiber, and though I didn’t weigh it beforehand, I think I came pretty close to dividing it in half for two bobbins. We’ll see how well I did when I finish plying. It’s a sturdy, soft yarn that I think will make lovely mittens and a hat. These intense blues didn’t photograph well in the late afternoon light, but the finished skein will get a real photo shoot, so you’ll see how pretty it is. I’ve been deeply engrossed in two wonderful books in these two days. While I was making yarn, I listened to Barbara Kingsolver’s Animal, Vegetable, Miracle. This is one of those books I am in danger of telling everybody they must read, but I’ll resist. If you love Barbara Kingsolver, and her writing voice, read it. If you are interested in the slow food movement and eating locally, read it. If you’re fond of the people of Appalachia in general and Virginians in particular (my people), read it. If you want to be someone who pays a little more attention to where your food comes from, read it. It’s not political or radical or preachy. It’s funny and informative and a delight to read. And a huge bonus: Barbara Kingsolver narrates the audio, along with her husband and a daughter. I’m looking forward to spending some time at the Animal, Vegetable, Miracle website, too. When I needed to lie down, I picked up Khaled Hosseini’s A Thousand Splendid Suns. It seems that everybody has been waiting for this book. They want to know if it’s a sequel to Kite Runner — it isn’t. It’s set in Kabul, so far, in the second half of the 20th Century, and the central characters are women. I’m only about two hundred pages in, so I don’t know much except that the characters are people I care about, and I’m willing to follow them to the last page. We all know the history surrounding the setting and the time period, so you can assume that this isn’t a light and breezy summer read. I am impressed by Khaled Hosseini’s writing voice, as it’s so gentle, and things seem to unfold rather than just happen. That’s a difficult feat, considering his story has such a strong historical context. Links to both books are over on the sidebar under “Books” (natch). I just reserved the Kingsolver book from the library! Thanks for the good recommendation, I’d been curious. 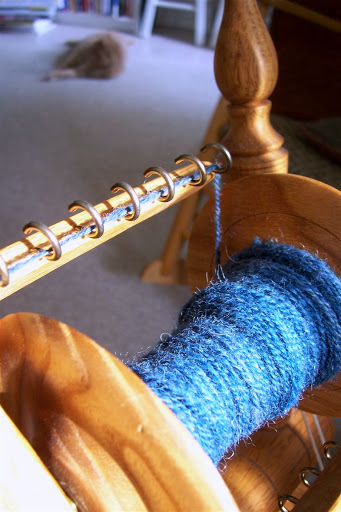 What a lovely post – Your spinning looks wonderful – and I lvoe the book reviews. thanks so much. May your nights be cool and your books divine. The yarn is a lovely shade of blue. Thanks for the review of the Kingsolver book. I’ve seen it mentioned on several blogs. Such pretty yarn! I’m really looking forward to “A Thousand Splendid Suns.” I’ll be getting it in a week or so, when my Audible subscription renews for the month. That is a gorgeous blue, and you’re saying it didn’t photograph well?! Wow.Thanks for the review of the Kingsolver book. wow I agree with Chris – if that is what you consider not photographed well I can’t wait to see that in person – lovely wonderful blue. Sounds like you had a perfect day!! Your people are Appalachian Virginians? Boy howdee cousin, did I know that? I’ve been waiting for that Kingsolver book to come from the library to me, and I’m losing patience. I’m on the wait list for “A Thousand Splendid Suns”, I’ve decided to read it rather than listen, though I have been listening to quite a lot lately. I head the author interviewed and someone called in and asked about the boy in his first book, how is he doing here in America. He had to gently explain that it was a work of fiction, but so many people took the characters to heart as real. I’m looking forward to this book. Not light reading, you must get overwhelmed with all of those books in front of you. Kind of like a yarn store owner trying to decide what to knit next!Love that yarn, I am looking longingly at my wheel this morning, but haven’t had time to touch it all week. I can see how spinning can help you after a holiday weekend. Beautiful shade of blue. It makes me smile to look at it. I just heard Kingsolver interviewed yesterday (again, actually) and while I no longer seem to have time to read more than a page a day (and that’s usually the Far Side calendar!) eating locally is something that would be incredibly easy to do where we live. I’d like to say my own garden will be a chief food source, but my black thumb might not allow that. Still, there are plenty of local growers, farmstands, and farmers markets around, and while we don’t grow coffee here, we have two roasters in our county who roast fair-trade coffee. The issue now is committing the planning time that would be required! Which camera do you use to take the photos? Its look very good.